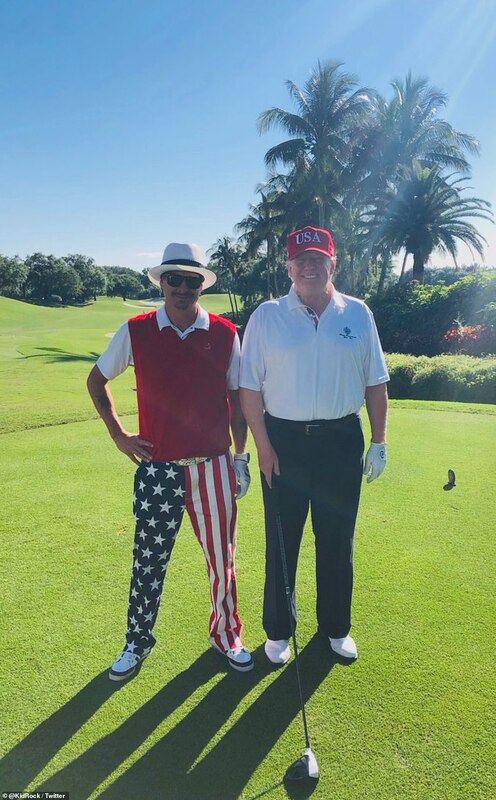 With the Mueller Report’s key findings expected to be revealed on Sunday, President Trump relaxed on Saturday by hitting the links with rocker-rapper Kid Rock. ‘What a great man, so down to earth and so fun to be with!! 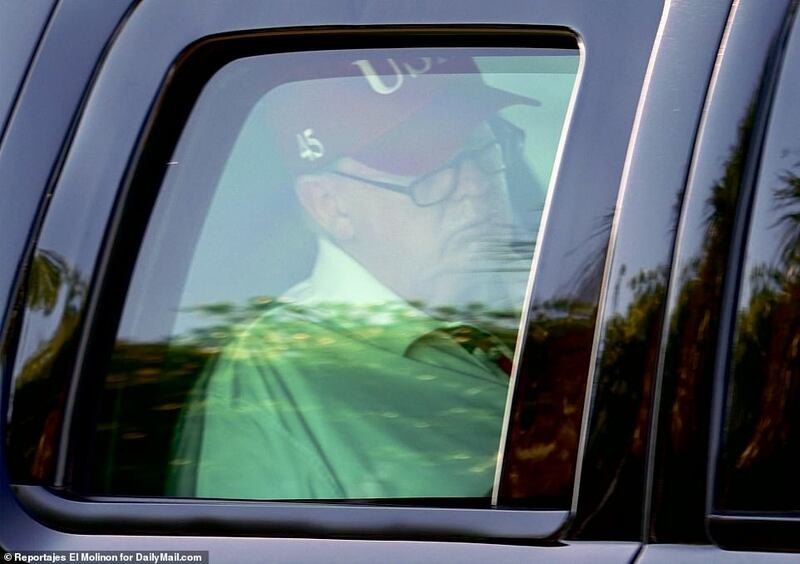 Trump has spent the day at his Florida golf course, appearing carefree but remaining silent on Twitter after Special Counsel Robert Mueller filed his final report. 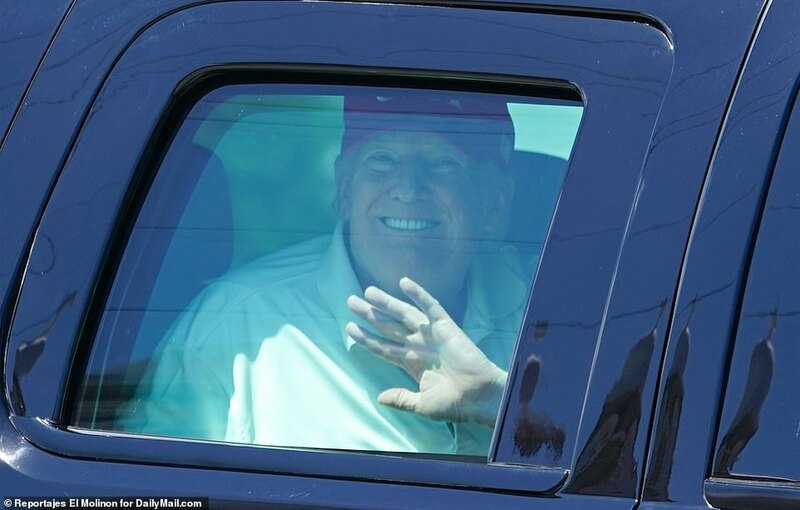 Trump, who is spending the weekend at Mar-a-Lago, spent about five hours at the course, with sunny skies above and a high of 77 degrees. 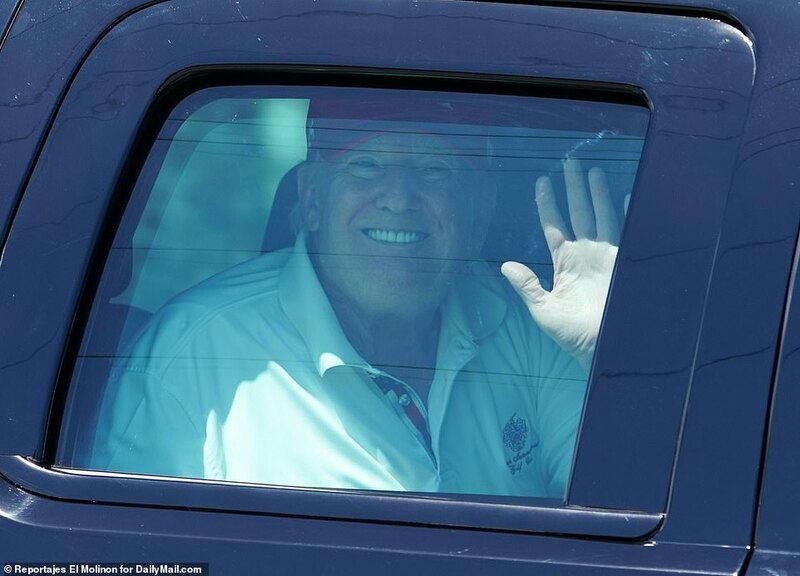 Upon leaving the club shortly after 2pm, he was spotted smiling and waving to supporters who lined the motorcade route. 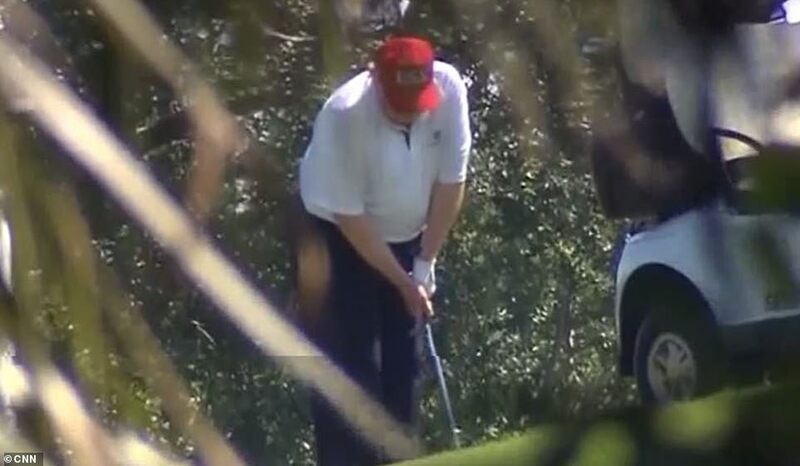 A White House official said that Trump was golfing with three partners, but declined to name them or say whether Trump had been discussing his thoughts about the Mueller report on the links. The White House confirmed that Trump has still not been briefed on the contents of the report. 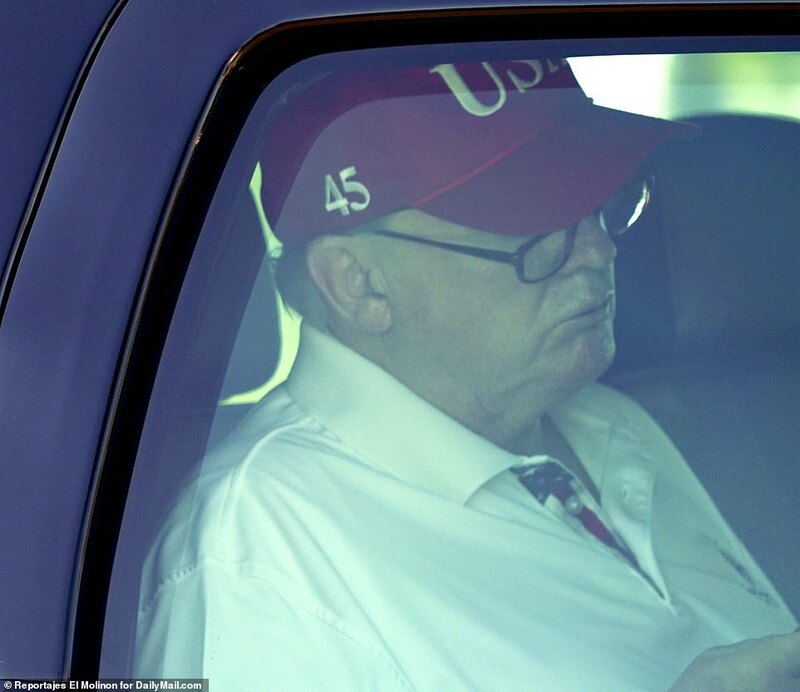 Attorney General Bill Barr’s summary of the report to Congress is now expected to be delivered no sooner than Sunday, an official said. 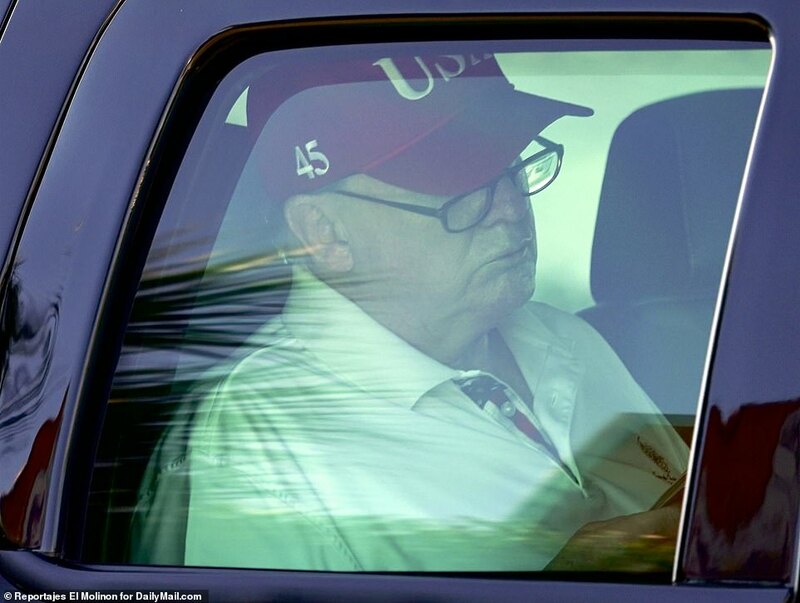 Earlier in the day, Trump was spotted perusing a newspaper on the way to Trump International, and wearing reading glasses, a red ‘USA’ hat and white polo shirt. 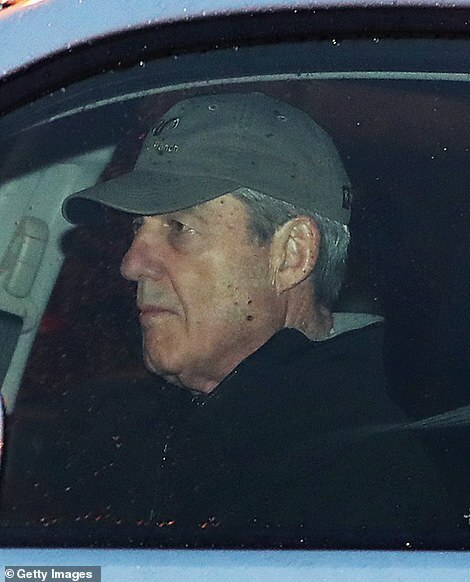 On Friday, a senior Justice Department official said that Mueller will file no more indictments with federal courts, meaning the president, his inner circle of present and former confidants and his family members are out of immediate legal jeopardy. 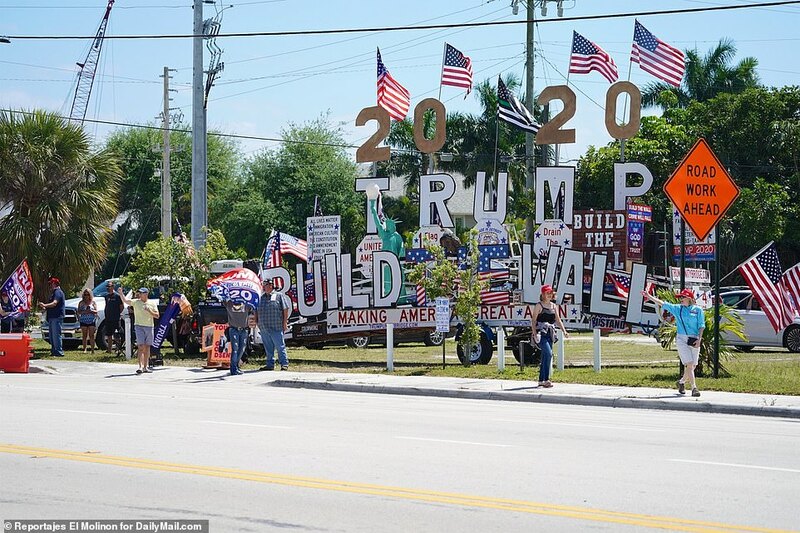 Trump had already arrived at his Florida retreat on Friday afternoon when Barr revealed that he had received the report. 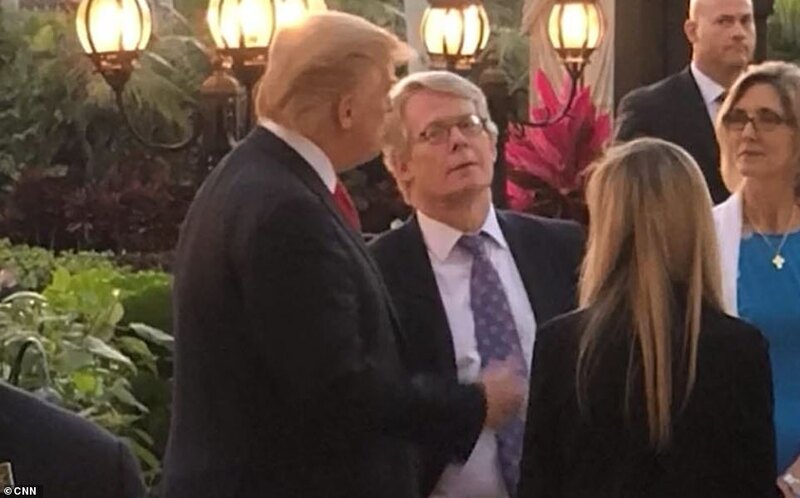 The president learned of the development as he sat on the tiled patio at Mar-a-Lago with the First Lady and their son Barron, according to CNN. The White House has not received a copy of the report or been briefed on it, according to Press Secretary Sarah Sanders. ‘The next steps are up to Attorney General Barr, and we look forward to the process taking its course,’ Sanders said in a statement. 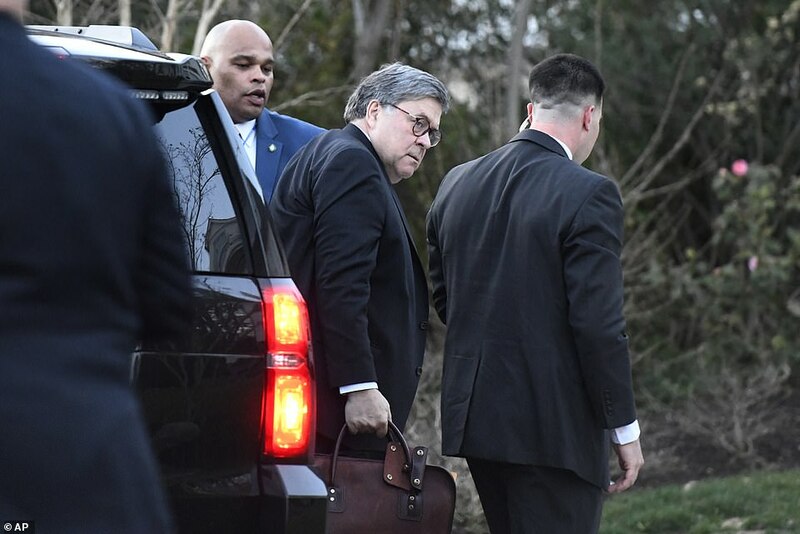 Barr is expected to brief Congress on the key findings of the report as early as this weekend. The president has remained uncharacteristically silent in the wake of the news, not tweeting once since word broke that Mueller had concluded his probe. 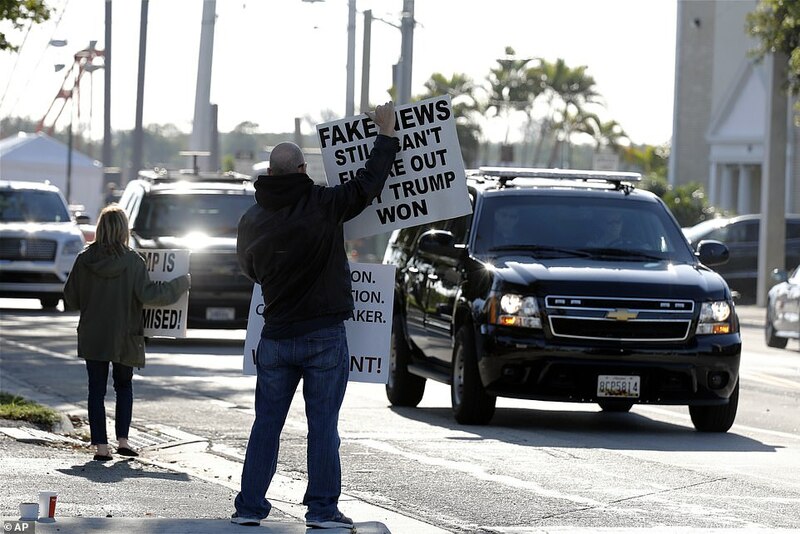 His silence has led some Trump critics to suspect that Mueller has uncovered incriminating information, but Trump’s supporters insist that the lack of new indictments is vindication for the president. 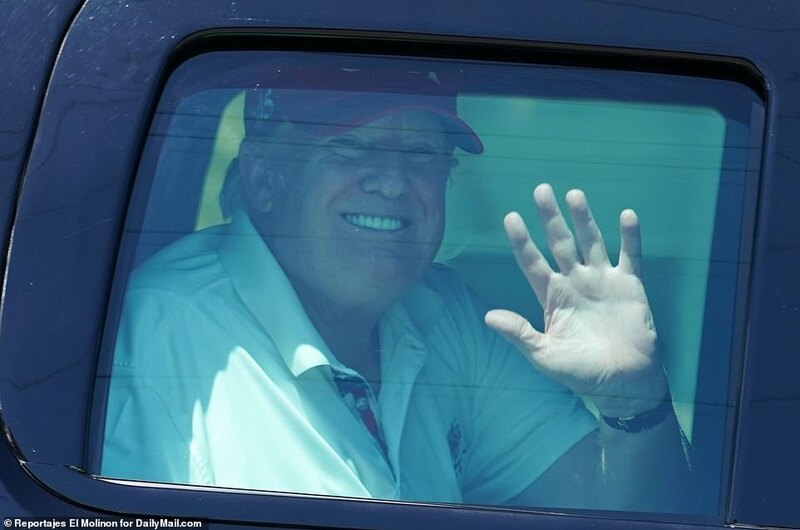 Trump’s motorcade on Saturday morning was the first public sighting of the president since word of the Mueller report broke. 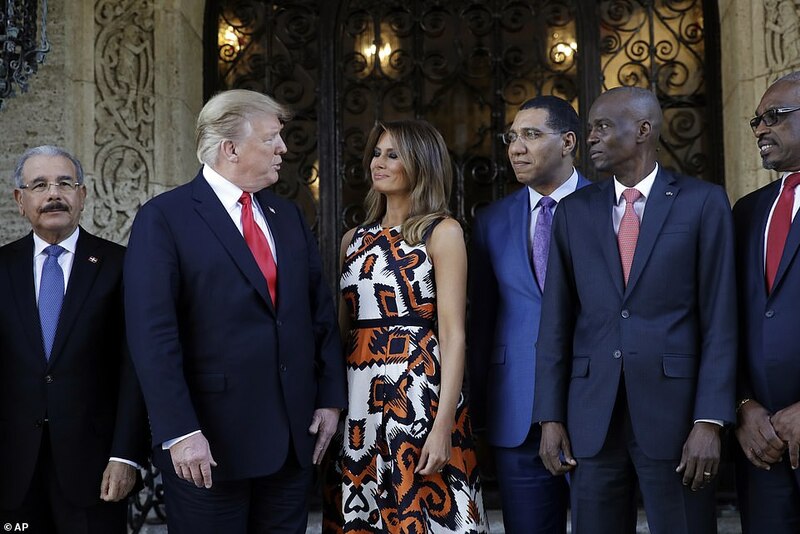 On Friday afternoon, a few hours prior to the news, he appeared relaxed and smiling alongside First Lady Melania during a a photo opportunity with Caribbean leaders before a working meeting at Mar-a-Lago. Melania wore a linen silk dress from UK brand LK Bennett featuring distracting bold orange, white and black Aztec-inspired prints. The cinched-in-at-the-waist ‘Andrea’ round-neck occasion dress is currently on sale for $282.50, down from $565. 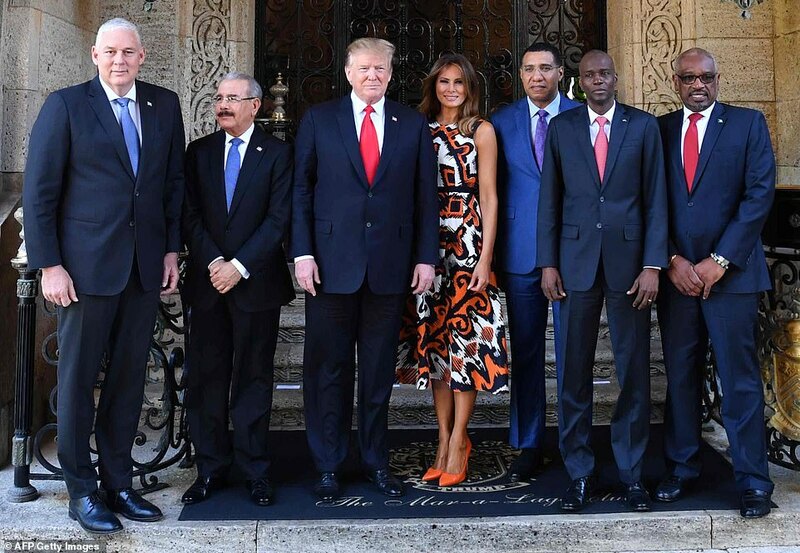 Melania paired the midi-length half price frock with Christian Louboutin heels. 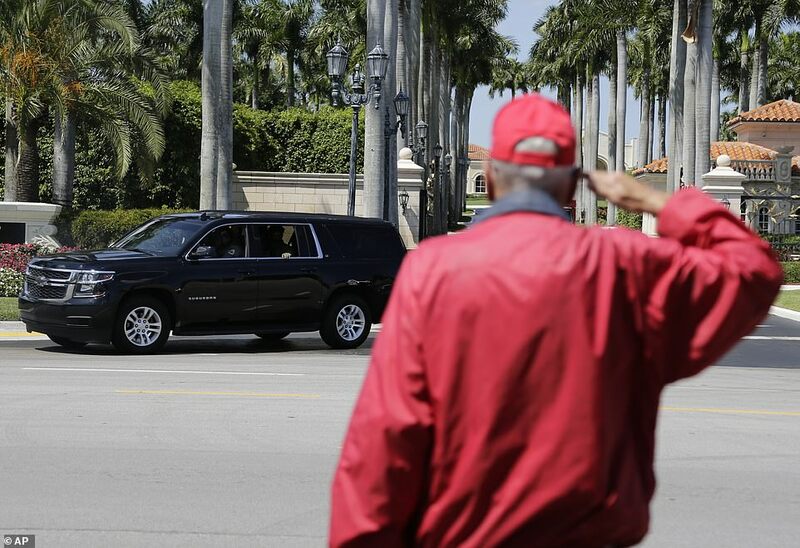 Trump has no public events scheduled until he departs Mar-a-Lago to return to the White House on Sunday afternoon. 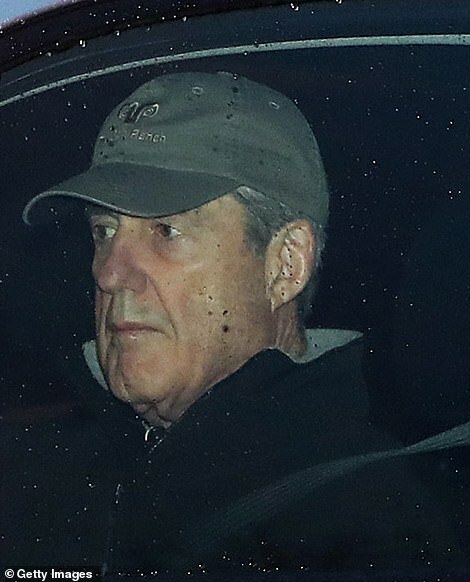 As the president relaxes in Florida, news of Mueller’s report has lit DC on fire, with political partisans from both sides trying to spin developments in their favor amid the gap in information about what the report contains. That person, who described the document as ‘comprehensive,’ was not authorized to discuss the probe and asked for anonymity. That’s good news for a handful of Trump associates and family members dogged by speculation of possible wrongdoing. They include Donald Trump Jr., who had a role in arranging a Trump Tower meeting at the height of the 2016 election campaign with a Kremlin-linked lawyer, and Trump’s son-in-law, Jared Kushner, who was interviewed at least twice by Mueller’s prosecutors. It wasn’t immediately clear whether Mueller might have referred additional investigations to the Justice Department.